WHY DO WE NEED TO BELONG TO THE BLOCKWATCH? We create a community network where relevant and essential information can be quickly passed to our members for their benefit. We get our know our neighbours making it easier to help when needed. We open channels of communication with the police. Criminals need our streets to commit crimes but by our patrolling and being alert – we as a community can keep them out of are streets. Ontdekkers Park South Blockwatch is a community based organization. 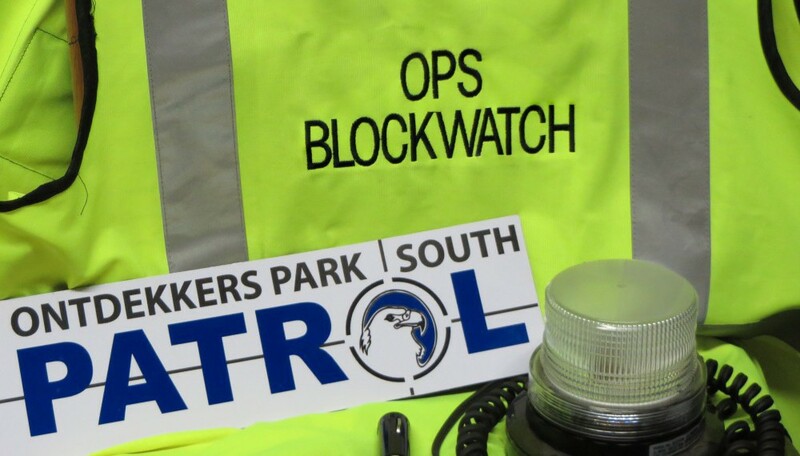 The Blockwatch was formed in 1989 in an effort to fight crime in the area. OPSB is made up of 602 families and membership of OPSB has now reached 63.79%. It consists of residents who volunteer their time and money to help combat crime that may affect the Blockwatch area. Municipal matters are also an important function of OPSB. To create an environment where residents and neighbours know each other, care for one another and eliminate crime. We also strive to maintain a high standard of professionalism in our area, The Blockwatch work under the auspices of the SAPS and CPF (Community Police Form) and is a non-profit organisation. We also serve as the eyes and ears of the SAPS. The blockwatch objectives are based on those of the CPF. Crime becomes a severe problem and the police cannot always protect us. The situation can only improve if we join forces with the SAPS and the CPF. The more community gets involved in the fight against crime the better for all. Insuring communication between the residents and police. Serving as the eyes and ears of the Police. Patrolling our area on foot, bicycle and vehicle. The identification and reporting of suspicious individuals and activities while we regularly patrol our blockwatch area. Supplying residents with up to date information on an on going basis. The volunteer OPS resident patrols have proved very successful and have been operational for some twenty years. Our crime figures are substantially lower than other areas around us. This is solely due to our OWN visibility. Crime trends vary on a regular basis and we adjust accordingly. To keep this a success, the more patrollers we have the more successful we are. New patrollers are always welcome and we can adjust to a time suitable for you. We patrol according to prescribed directives which is supported by the police and protects the patrollers from unwanted interference. Additional cars patrolling will keep any criminal element guessing. Visible policing remains the key to crime prevention. IF YOU ARE INTERESTED IN PATROLLING PLEASE CONTACT THE OPS CELL NO 078-813-1391. Wouldn’t it be wonderful if everyone knew each other, if a neighbour would greet you on your way to work in the mornings, if you could phone a neighbour when in need, if your kids could play in a park that is clean and well maintained and eliminate all suspicious vehicles and people ? ALL OF THIS IS POSSIBLE IF WE JOIN FORCES AND WORK TOGETHER. The Roodepoort precinct serves an area of 92.49 sq. km and is one of the biggest in South Africa. The Roodepoort CPF is the link between the Roodepoort SAPS and all the Residents Associations. A Representative from each Residents Association attends a monthly meeting with the CPF to enable communication between the police and the residents. Sector policing finally became a reality in Roodepoort at the beginning of 2000. The Roodepoort precinct has been broken into 6 sectors, each with its own vehicles. The sector has its own manager and allocated staff. These SAPS staff are dedicated to the area. Our sector is known as SECTOR 3. You may have noticed that Dunmar Security patrol the streets of Ontdekkers Park South Blockwatch. This became necessary as we needed to build a close relationship with a security company that could assist in case of a real emergency and police cannot assist.